Yesterday the full version of Crayon Physics Deluxe was released for the PC with a bit of cryptic blog post. So I thought I’d answer some of your burning questions by providing a demo and a FAQ. 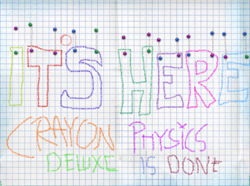 So yes, Crayon Physics Deluxe is finally here. You can go and buy it for 20$ from here. Or you can download the demo and give it a test. There’s been a lot of questions going around about the game so I though this would be a good place to go through some of them. It’s sorta like a quick FAQ about the game. When in doubt, you can try the demo to see if it runs on your system. Unfortunately not at this moment. I’m planning of doing these as soon as I’m done with the PC version of the game, but I can’t promise anything at this point. Check your spam and if you can’t find anything try this tool: http://www.crayonphysics.com/resend_secretkey.php. If that doesn’t work email me at crayonphysics@gmail.com and I’ll get back to you with your lost email. The quickest way to get help is to go the forums. You can also email crayonphysics@gmail.com and I’ll get back to you as soon as I can. This entry was posted on Thursday, January 8th, 2009 at 1:13 pm	and is filed under Crayon Physics. You can follow any responses to this entry through the RSS 2.0 feed. Responses are currently closed, but you can trackback from your own site.